Ted’s latest is a slight departure from his usual, both in subject matter and in style. This is not another episode of his successful Rags to Riches series; instead we are introduced to a completely new set of characters. Sunshine, wine and naturism feature as you would expect, but there are new and different themes. As the newcomers to the South of France battle to get themselves up and running in their local community, we are treated to some amusing insights into husband-wife relationships, local customs, and the problems of using inadequate tools to battle with overgrown gardens. There are a couple of interesting stylistic developments in this novel. 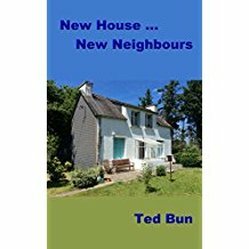 Ted has chosen to write this one in two ‘first persons’, alternating the narration between Jerry, the husband, and Fran, the wife. This device allows the author to exploit, in a good natured way, the comedy of the differences between their views of themselves and that of their spouse. The author’s wry humour defines this whole book, whether he’s poking gentle fun at French rural life or the vagaries of technology. As always, the story is bathed in happiness and optimism. There is no dark side here, just good fun.